A dish is always a product of its ingredients. When creating a dish from a small number of ingredients, this adage rings especially true. 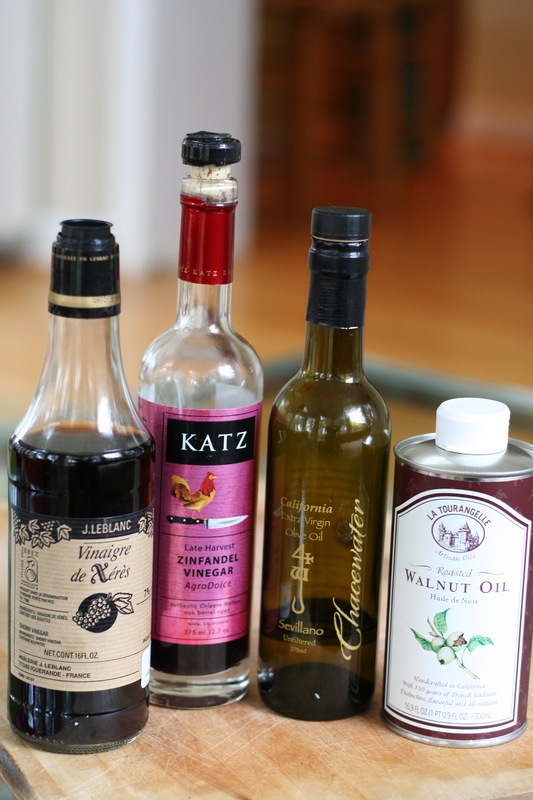 In salads, the ingredients really shine, so, when you can, spend more for top quality vinegars and oils. Think about it: you only use tablespoons of oil and vinegar to dress a salad. What seems like a splurge in costly oil and vinegar is worth it in the long term, and the results are delicious and satisfying. In the photo above I’m showing you several of my favorites that are currently in my fridge and pantry: sherry vinegar; a sweet and sour, late harvest Zinfandel vinegar; virgin olive oil; and walnut oil. All of these I find highlight my fall and winter salads well. Taste a variety of your local offerings, and your efforts will be rewarded. This entry was posted in Cooking Basics, Salad and tagged cooking basics, oil, olive oil, vinaigrette, vinegar. Bookmark the permalink.